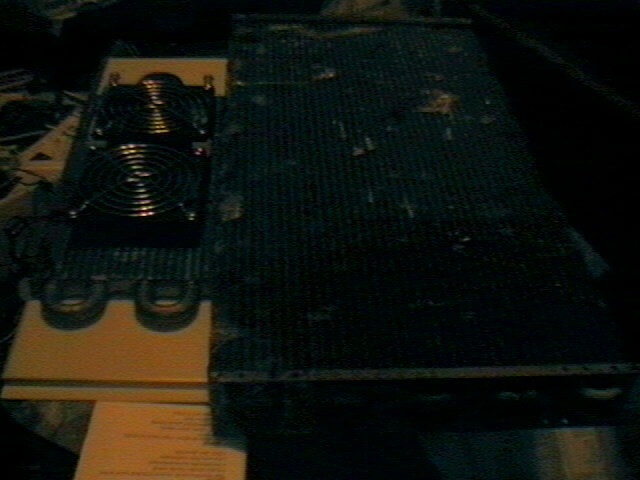 The radiator I used I got from the junk yard, but its the same that you could find at Autozone or another parts store. Its a 5"x12" transmission cooler with 4 passes and 3/8" tube fittings. I have two 80mm fans mounted on it to blow air across and out of my case to cool it. Without the peliter running, I get cool air on my feet, with the peliter running, I get nice warm air and my feet don't freeze. The radiator on the left is the radiator I'm using in my setup. The HUGE SOB on the right is one I found in my car port(yes I found it) that a friend of mine wants to use. Sorry for the picture quailty, I don't have proper lighting.